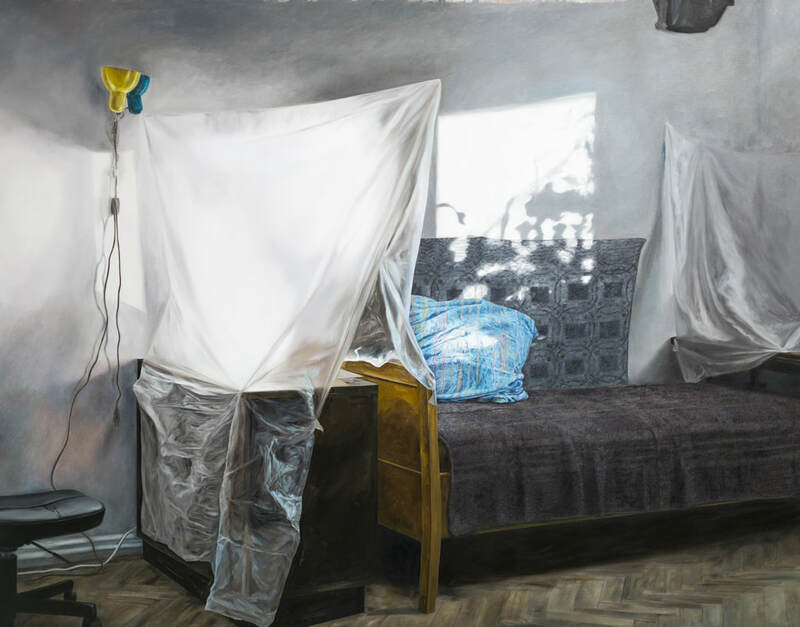 ​Ana Maria Micu's paintings are based on photographs the artist took of her immediate surroundings: a typical Romanian apartment built in the Communist Era that she uses for both living and working. Micu has long occupied spaces like these, moving from one apartment to another only to encounter the same architectural and design principles repeatedly failing her needs. Over the years, the artist has developed an appreciation for the mechanisms she has had to invent in such spaces in order to successfully merge her household with her artistic practice. 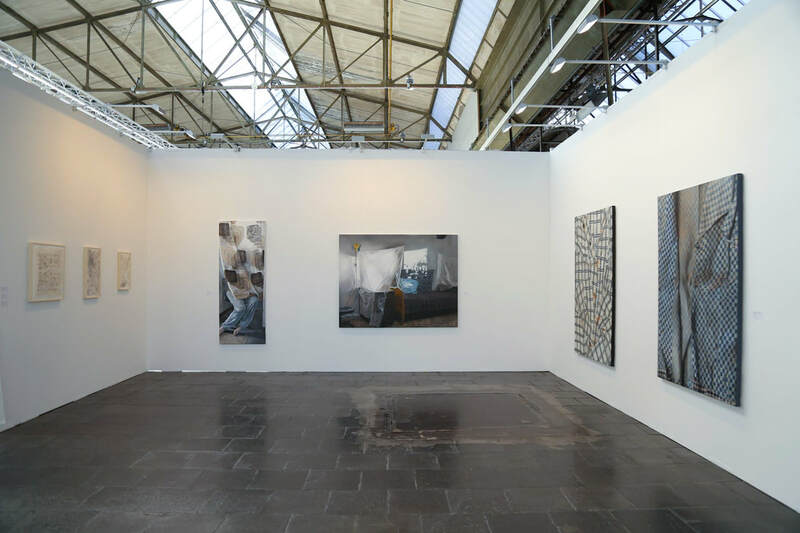 In her low-key, unassuming images, the artist eschews the intimate aspects of her life, and instead experiments with the larger meanings to be found within the domestic and the banal. I constantly find myself within a set of physical and conceptual circumstances in which nothing is possible without beating the odds. As a result, I have come to love the convoluted routes I’ve taken to accomplish certain things. Though my accomplishments in this sense seem rather modest --I prefer to think of them as “minor acts of living”-- the visual documentation I keep of these biographical instances are indicative of a particular kind of lived experience. Much about contemporary life seems to me incredibly complex and insurmountable. As I feverishly explore my available options, I am often coming to terms with the notion that the only smallest feats are, in fact, within my reach. For example, the tents of plastic sheets featured in my painting are a depiction of an improvisational effort to protect some of the unfinished drawings in my apartment. I do not know for sure whether this protection was necessary, or if it was even the best way to go about it, but it was something I could do and I am content with the way I did it. Even in such cases when my efforts are absurd in a larger context, I still find it worth executing them, if only for the most basic degree of agency they beget. Any minor act of living is poetic, to me. Most of the scenes in this series of paintings are recorded as they happened, though in some cases, I was inspired by a situation and elaborated on the spot. In the calm, ... Is this pattern, it was necessary to introduce imagery of my body into the existing scene, partially obscured by the patterned curtain. My physical proximity to my drawing became important to the narrative, resulting in the depiction of my bare feet touching the cement floor. This idea only came to me after several weeks of living with the curtain draped over an office chair, protecting a drawing stored on the table behind it. While this narrative is not necessarily obvious in the finished work, the personal significance within it bolstered me through the lengthy, meticulous process of painting. Through conceptual processes like this, I’ve learned that my decisions are not only a product of inspiration and creativity, but also of vast sets of external circumstances that are both in and out of my control and awareness. A key aspect of my practice is trying to understand these mechanics. So too do I see beauty in the utilitarian, unpretentious character of dwellings like the ones in which I have lived and worked. At first glance, one might not think much of such environments, but with these images, I highlight the creativity that a minimal, specifically constructed model can foster.